Originally published in 1984. This annotated bibliography will serve as a starting point for information on the issue of nuclear power. 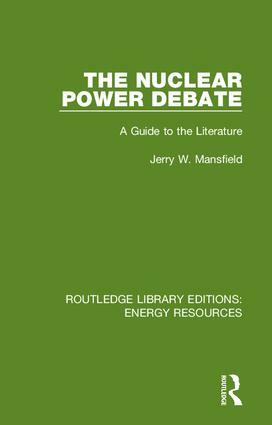 Arranged for easy use into three sections – Pro-Nuclear, Anti-Nuclear, and Neutral – the book cites over a hundred of the most important books on the subject, offering for each full bibliographic data and a lengthy annotation that is balanced and informative. This work, which features author, title and subject indexes, is simultaneously a collection-building tool, a guide for non-specialist library patrons and an invaluable aid for research. Reissuing works originally published between 1961 and 1990, this set of 12 books offers a selection of scholarship on the history of natural resources used for energy provision. Many of the titles discuss the nuclear power debate from various angles while others look at coal, or resources and energy in the third world.